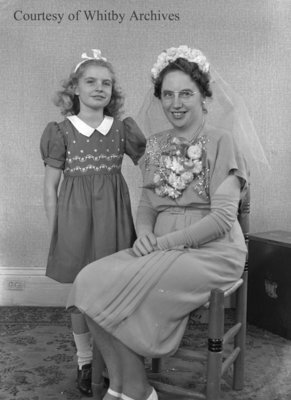 A black and white large format negative of Mrs. Murdock and a little girl taken on Mrs. Murdock's wedding day, November 29, 1947. In this view Mrs. Murdock is sitting and the little girl is standing on the left. Mrs. Murdock and Unidentified Girl, November 29, 1947, November 29, 1947, Marjorie Ruddy. Whitby Archives, A2013_040_482.